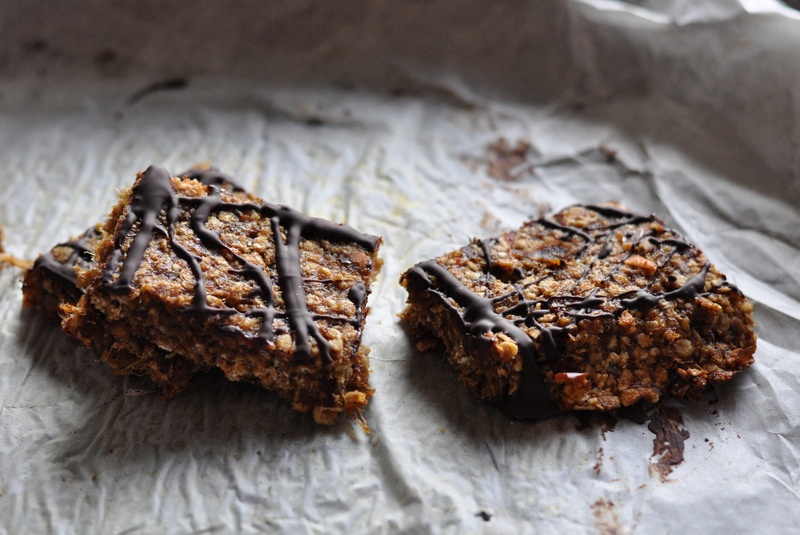 I think it was about time I shared another sweet recipe here on the blog again. And if you read my last post, about my own personal history with food (sugar in particular) and how I made eventually made peace with it all, then you will know that I love the taste of sweet. Dates are such a versatile food. They are sweet and sticky and actually good for you with a high amount of fibre, but also the vitamin and mineral content like zinc (for immune system) magnesium (for energy production), iron (for red blood cells) and potassium (for nervous system). Because of their “stickability” they work really well in all types of raw desserts as they so seamlessly hold everything together. I also love that when we are using dates as sweeteners we tend to use the whole fruit, just like nature intended. 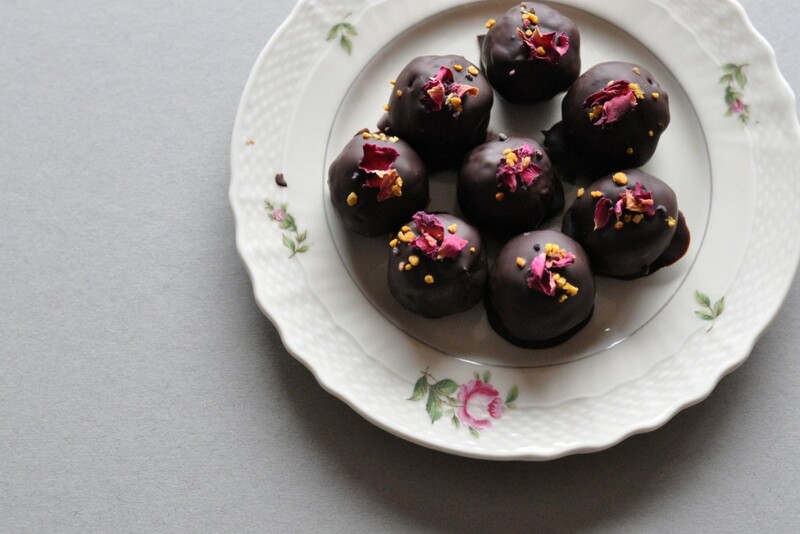 This recipe is based on a typical traditional Swedish recipe and one we made time and time again as kids – Choklad Bollar. 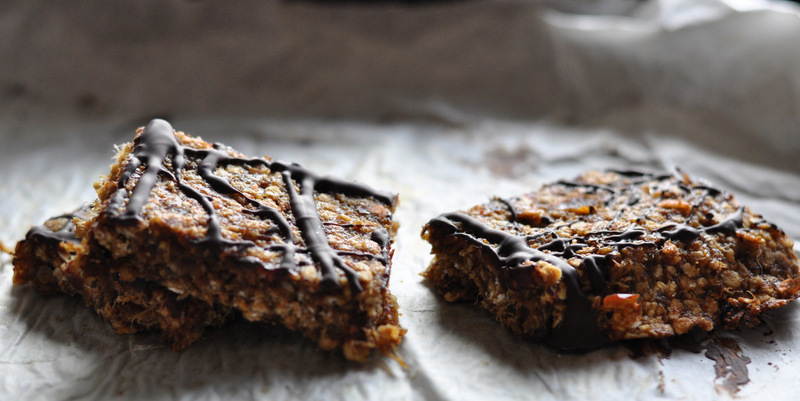 The original recipe calls for butter, sugar, oats and cacao powder. And perhaps a little coffee too. Here I have replaced the butter and sugar with the dates and added some melted cacao butter as fat. You can use coconut oil too. 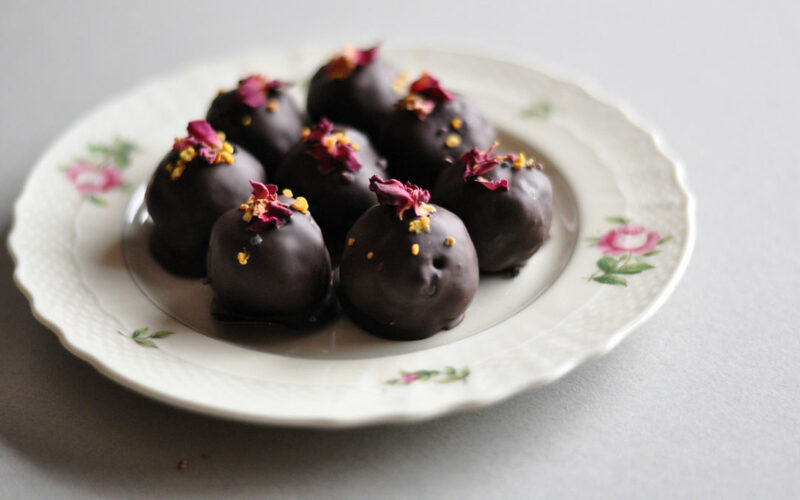 Traditionally “Choklad Bollar are rolled in desiccated coconut, which I personally like though I made another version of these for a recent talk I did locally and rolled them in some melted dark chocolate and some roughly chopped toasted hazelnuts. Much like a giant Ferro Roche… Yeah, just imagine! Totally worth the extra effort. 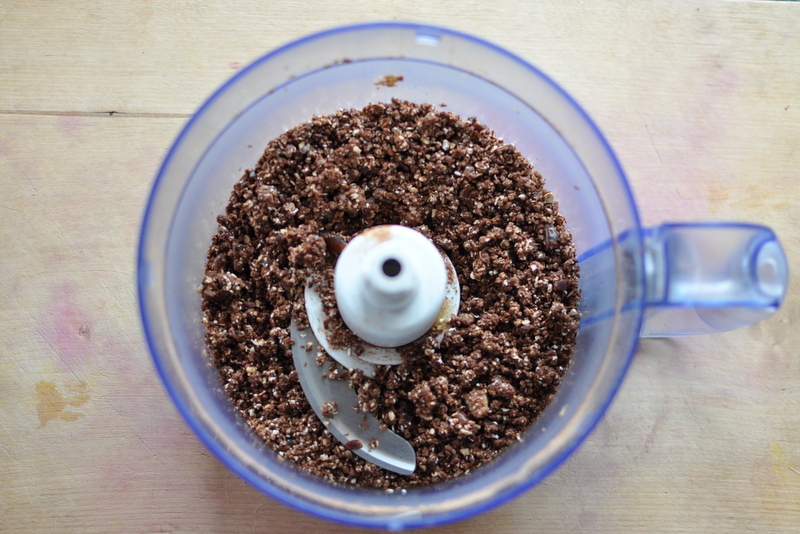 First blend the oats in your food processor until you have a rough ground texture. Soak the dates in some hot water for about 1 min, then drain. Just to soften them a little. If you are using Medjool dates you can skip this step as they tend to be much softer. However don’t forget to remove the pits! Add the rest of the ingredients to your food processor and blend until it all comes together like a sof dough. 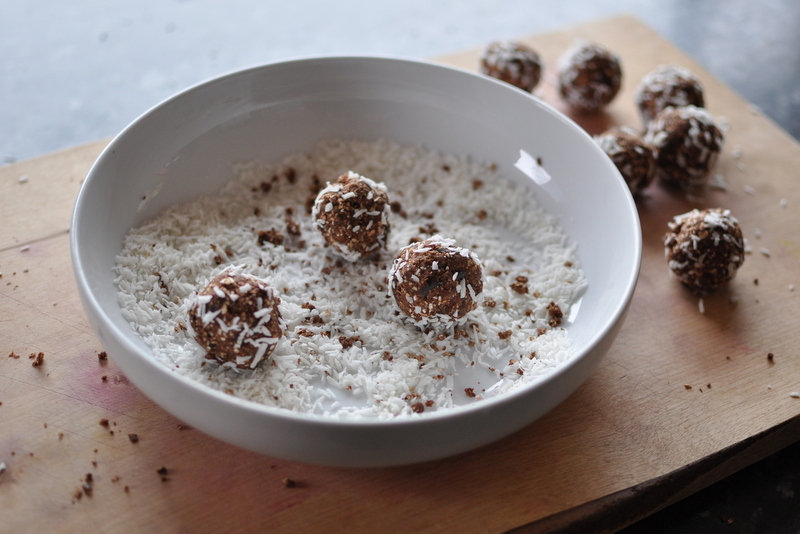 Roll the dough into small balls with your hands and roll them in some shredded coconut. Store in an airtight container in the fridge. They will keep for a few days. I’ve been meaning to share this recipe with you all for ages. It’s one I came across months ago on the lovely Pippa Kendrick’s website The Intolerant Gourmet. 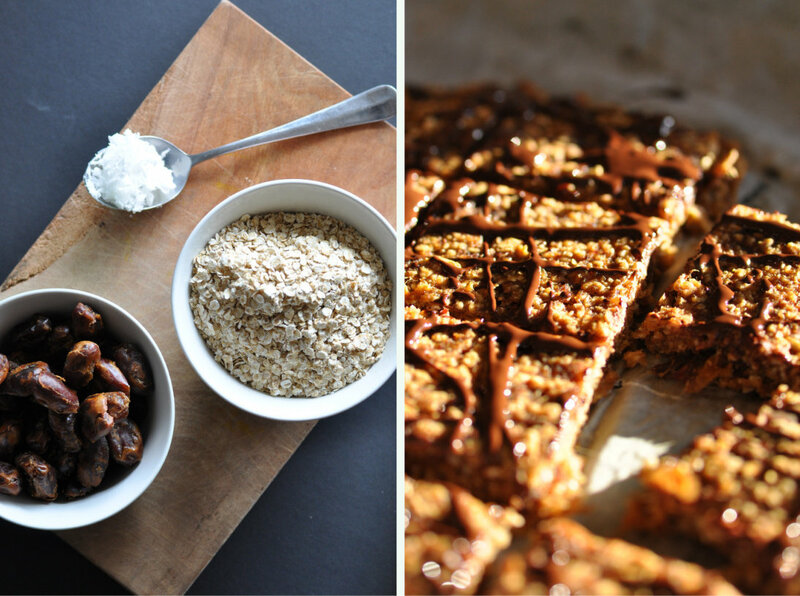 I’ve been making these delicious oat squares from time to time and it is one of the recipes I most likely give to clients when they are asking for healthy snack options. Which is a question that I get asked A LOT! Most of us have this thing with snacking… Through some curios observations, both personally and with clients I’ve come to the conclusion that there’s a few legs to the snacking stool. And intertwined with it is one of my favourite topics, hunger & satiety. Are you ready to look a little deeper of what function snacking has for you? First up; eating regular meals to keep our blood sugar stable. There’s not much arguing here really, this is an important factor. Eating smaller meals with regular intervals ensure that your body and brain has as continuous supply of energy to run on, preventing you from getting on the dysglyceamia roller coaster. Personally eating smaller meals and maybe 4-5 times / day seems to suit my digestive system a lot better. This tactic is also one I use with many of my clients when they need to get a handle on their eating pattern, especially if they are stressed. Sometimes you may even see eating up to six times a day recommended, from some sources. But then there’s the other end of the spectrum which recommends eating fewer meals, slightly larger portions and in an 8h time frame, leaving your body 16h to fast, most of which is done overnight. This works really well for others who have a sensitive digestive system which needs a longer rest from food. So how do you choose? How do you actually know what suits your body best? Well this is where a mind-body approach to eating comes in. You are really the only one that can figure this out. It’s time to begin to listen to the signals that your body is using to get your attention. Do you know what true hunger feels like to you? What are the first subtle signals your body send out, telling you it is looking for food as it’s running out of fuel? And do you know what it physically feels like when you have reached the stage of ravenous? Here is when having a healthy snack like these oat squares, or my other favourite snack: fresh fruit and nuts come in handy. If you know that there is a long gap, more than 3h between say your lunch and dinner, having a snack somewhere in between can greatly reduce the chances of you eating all around you when you get home to cook dinner. Simply because you are now not only hungry, you are ravenous. I’ve also had patients who are the total opposite to this. They don’t know what their true hunger really feels like, because they never allow themselves to get to that point, out of the fear of losing control and binge like I just described above. If this is you, then I would invite you to, when you are in a safe environment to sit with your hunger sensations for awhile and take note how they show up in your body physically, before you start eating. What will really happen if you stay with those feelings and sensations rather than act and react to them immediately? Sometimes the desire to control our food intake is a response or a message that we want to have a sense of security in our life, especially when there are other things going on in our lives that makes us feel helpless and out of control. Another thing to note, is that the composition of your meals, will likely also play a role in how much desire you have for snacking. If your meals are mostly made up of quick releasing carbohydrates like white bread, sugary snacks like chocolate bars as well as caffeine (on it’s on or combined with the others) chances are that you will want something to eat again after two hours. Or if you have a small bowl of soup at lunch and still have several hours to work and commute until you get home to make dinner, it is going to be difficult to say no to any cakes, biscuits or other treats that may be lurking around the office, for sure. Because chances are that it’s not your willpower that’s low, it’s your fuel gauge. When you start having meals that are a combination of quality carbohydrates (such as whole, and I mean literally whole, grains, fruit, vegetables), some healthy fats and some protein and also make sure you eat enough to feel satisfied, chances are that you will find yourself snacking less. However, I believe that sometimes we do need a lighter small meal or snack to fill in that gap between something more substantial. 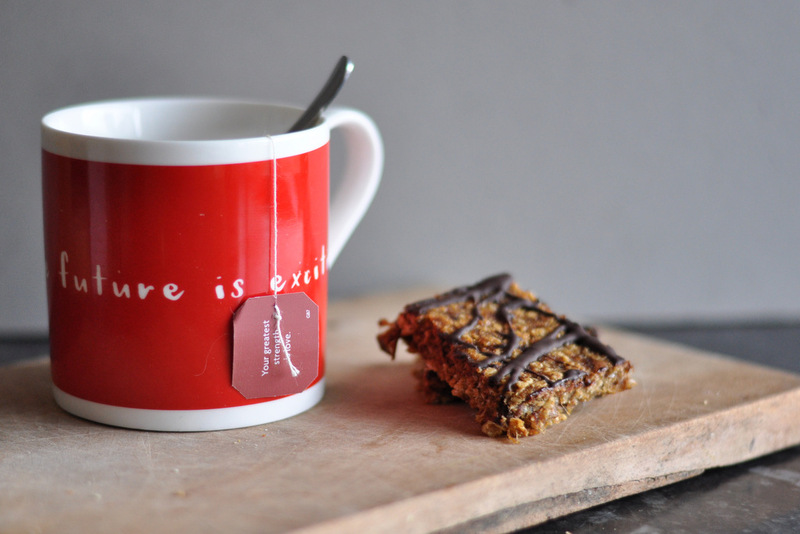 And sometimes we just want to eat a little something for pure pleasure, whilst caring for our bodies by feeding them something nutritious at the same time. And whatever it is for you, I hope that these little guys will fit the bill for you. They certainly do for me! This recipe is so simple with the minimal of ingredients. I just love it. They keep well for a few days and make a great lunch box addition. Lots of fiber from both the dates and the oats. To me this is wholefood baking at its finest simplicity. I have barely made any changes to Pippa’s original recipe. Preheat the oven to 180c and line the baking tin. Roughly chop the dates, place in a saucepan with 250ml water and bring to a gentle simmer. Leave to simmer over a low heat, uncovered and stirring occasionally for 15 minutes until the dates soften and form a thick paste. Stir the oats, salt and coconut oil into the dates until combined and then spread into the baking tin, leveling the top with the back of a spoon and in a square shape. Bake for 15-20 minutes until golden. Remove from the oven and cut into squares. Leave in the tin to cool completely and then transfer to a board and re-cut the squares before serving. Melt the chocolate in a bowl over hot water and then drizzle it generously over the cooled squares. 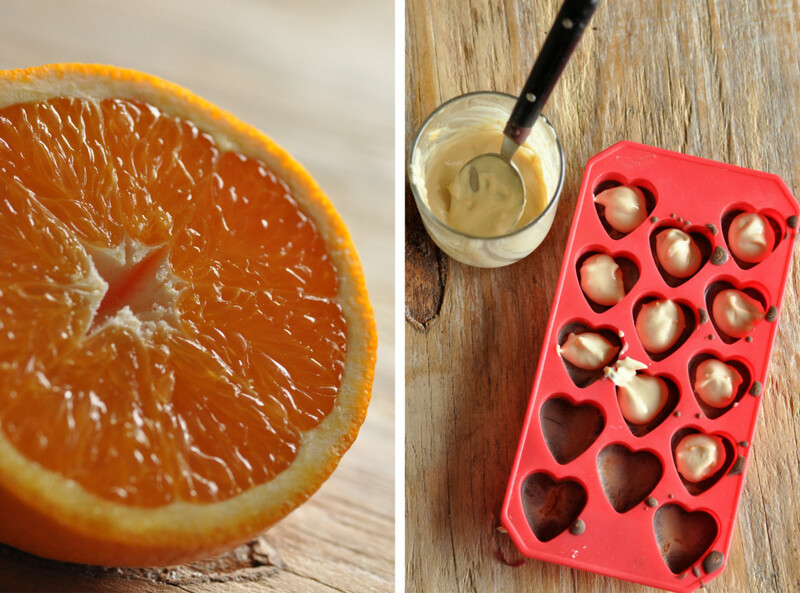 Can you have sweet treats that are actually beneficial to your health and body? I, for one, would like to think so. It can be so confusing knowing what to eat these days… However if you stick to the “wholefood principle” you can’t go too far wrong. The overall message coming through from research done in the field of nutrition and health still seem to echo that food which are close to nature IS the most beneficial kind of food for our health. This is also probably the one thing everybody in the field of nutrition and health agrees on, regardless of what food camp they belong to. I really like simple when it comes to cooking. If you have beautiful fresh ingredients to hand, usually this is the best way to allow them to bask in their own glory. That said, I truly appreciate people who have the skills of Culinary Art, and the ability to create wonderful dishes full of complexity and flavour. If you’ve ever watched Master Chef (the Australian version is my favourite), then you know what I mean! Impressive attention to detail, dedication and passion. My life is often complicated and busy enough on most days though, to be able to cook like that. And if you are like most people, I’m guessing that yours might be too. So how about we just stick with simple for now? I’ve had a couple of recipes using raw cacao here before. Like this one with peanut butter and coconut oil. It’s actually quiet easy to make your own. Here I’ve used some silicon molds that I bought a few months ago. I think using them, gives a slight creative edge… 😉 And they are certainly vital if you want to make chocolate with fillings! From some trial and testing I’ve found maple syrup to my preferred type of sweetener for raw chocolate making. It seems to be the one which blends the easiest with the raw cacao butter and the cacao powder. It is a completely natural sweetener made from the sap of the maple tree. Yes it is a sugar, yes too much sugar isn’t all that great for our health and can contribute a whole host of chronic disease, but remember what I said earlier about “wholefoods” and “close to nature”? And I don’t know about where you live, but over here it is a fairly expensive product so I for one don’t tend to consume it in any larger quantities. Most over-consumption of sugar (usually in the form of High Fructose Syrup) comes from an over-consumption of processed food… Just saying. Sesame seeds, used here in the form of Tahini has several health promoting benefits like being good for the skin due to its content of the antioxidant Vitamin E. Some studies has also shown sesame seeds to be strengthening to the heart and protective of the liver. It’s also worth nothing that sesame seeds are a high in calcium, which may alone be a good reason to include them in your diet, just to make sure you have a variety of calcium sources to keep “them bones” healthy. Tahini can be a little bitter. To be honest, it’s taken me some time to become a fan, but I really like it now. I haven’t included any maple syrup here in the filling as I think the juice from the orange has enough sweetness and breaks through that bitterness. Taste it and if you want the filling a little sweeter then add a drop of maple syrup. If you are still stuck for some Christmas present ideas and want to give a gift with a difference this year, then why not make a batch (or two) of these? Place them in a cute box wrapped with pretty paper – done! Melt the cacao butter in a bowl over a saucepan of boiling water. Once the cacao butter is fully melted remove the saucepan from the heat but keep your bowl with the cacao butter on top. 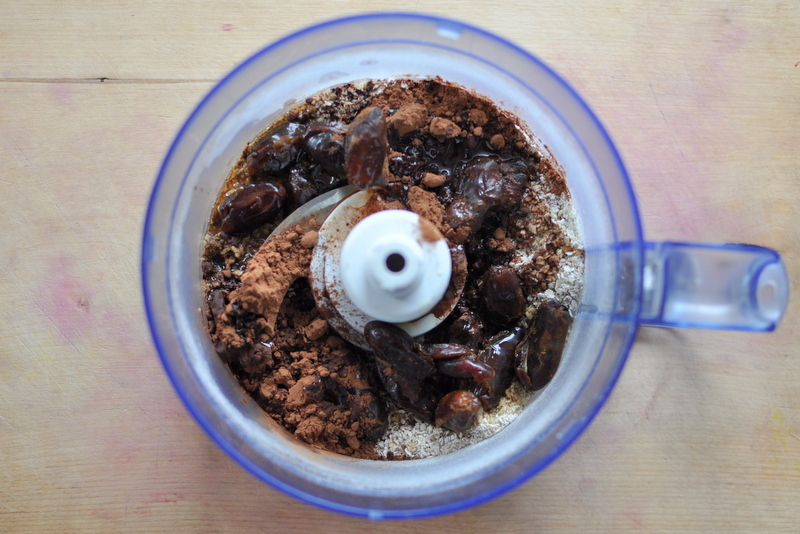 Add the cacao powder and mix with a spoon or small whisk until smooth. Then add in the maple syrup and stir again until it’s nice and smooth. Carefully remove the bowl with the chocolate mixture. If possible, take care to not get steam into the mixture as this will cause the chocolate to split. Take out your mold and fill each section to just under half. Place the mold in the fridge to harden. In the meantime mix tahini, orange juice and orange zest together in a small bowl or glass. Taste is and if you think it’s too bitter then feel free to add a little maple syrup to taste. After about 30 min, when your chocolate in the fridge has hardened, take out the mold and carefully spoon a little tahini mix on to each of your chocolates. Then fill up the rest of each mold with more chocolate. Place back into the fridge and allow to set completely. *Note to keep the chocolate mixture fluid for your second addition, simply place your bowl over the saucepan with the hot water from before. If it starts to set, reheat the water some more. 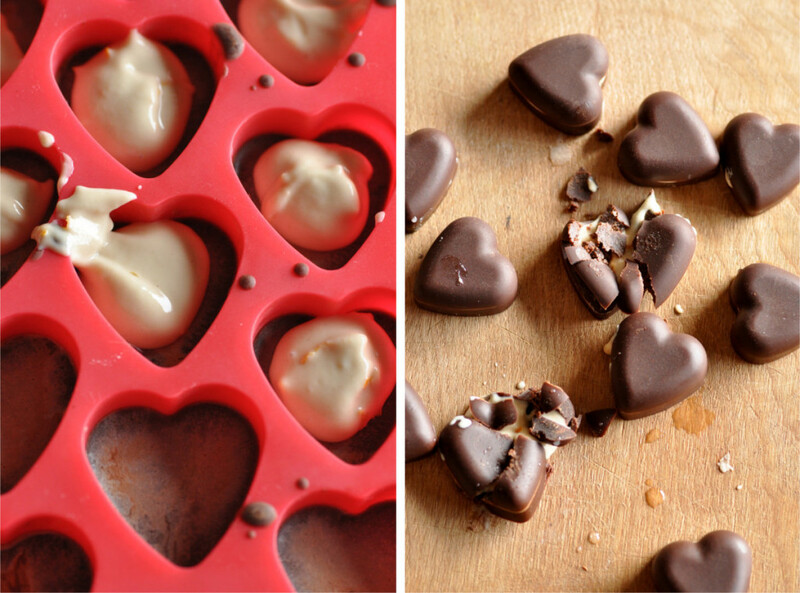 Once the chocolates are fully set, usually after 2-3h in the fridge, pop them out of the mold and store in a container. 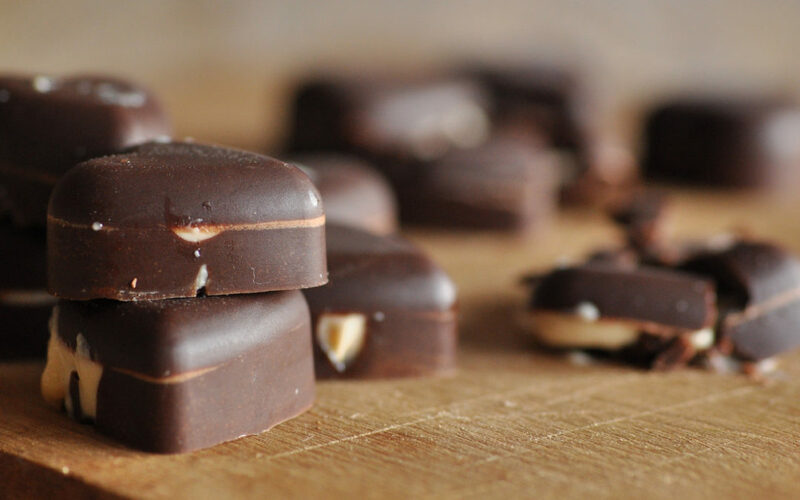 The chocolates are best stored in the fridge and eaten within a week. A (good) few week’s ago I got sent a lovely box of goodies to try from the superfood company Iswari. The company has it’s head quarters in Kinsale, Co. Cork, not a million miles away from where I live. Teaming up with a company that offers great quality products, sustainable ethos and is based locally kinda feels like a no-brainer. 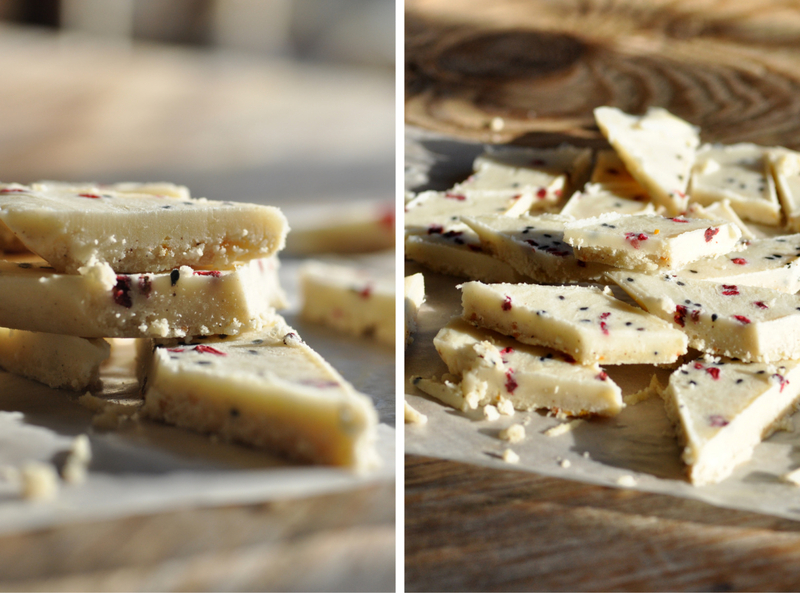 So I’m happy to give you all a delicious recipe made with their raw cacao butter. Cacao butter is a fat which is solid at room temperature but melts quiet easily at body temperature, around 34°C. In fact it’s often used in skin and beauty products and with a few simple moderations to this recipe you can make a nice skin moisturiser! Cacao butter, even without the cacao powder has a lovely chocolate aroma. Even though most of the health boosting properties from chocolate is found in the cacao powder the white solid fat is always added back in later in the chocolate-making process and whether you are making your own chocolate or buying it you want to use cacao butter (or make sure whatever you’r buying has a high cacao butter content) It’s the cacao butter which help make the chocolate creamy and gives it that snappy consistency. I went for a different kind of chocolate treat here though. For some people the caffeine content of chocolate can make them feel all jittery and not all that awesome. (Luckily I’m not one of them) So a white variety without the cacao powder, may be better suited. Commercial white chocolate is made by adding milk solids, soy lecithin, refined sugar and vanilla and is usually not all that great for you. 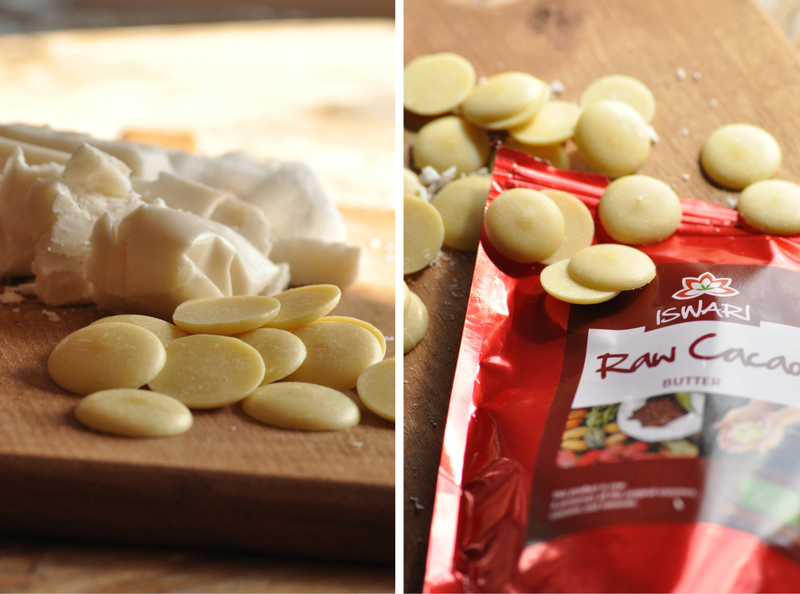 Here I’ve paired the raw cacao butter from Iswari with some pure creamed coconut. You can buy creamed coconut in most Asian store for a reasonable price. It comes in a solid block (at room temperature) and is basically pressed coconut meat and nothing else. The beauty of using creamed coconut instead of coconut oil is that the creamed coconut still contains all the fibre from the coconut meat + all the lovely health benefits from the coconut oil. So what you end up with here is a naturally dairy free white chocolate, not overly sweet and boosted with some super foods. I added some bee pollen, freeze dried berries and some black sesame seeds, both to boost the nutritional value and to increase the aesthetic appeal. Because I feel we eat as much with out eyes as we do with our other senses. Add some of these little gems on top of your smoothie or as here in your wholefood’s treat for a true super food boost. And bring out your inner artist! 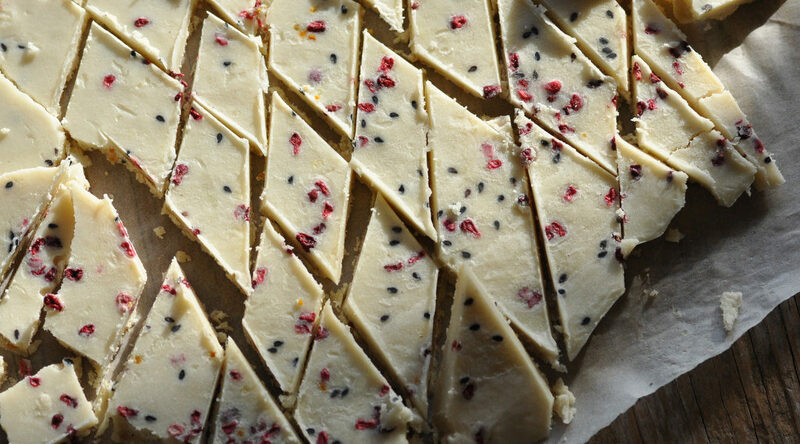 This white chocolate recipe is really easy to make and takes literally no time at all. Roughly chop the creamed coconut. 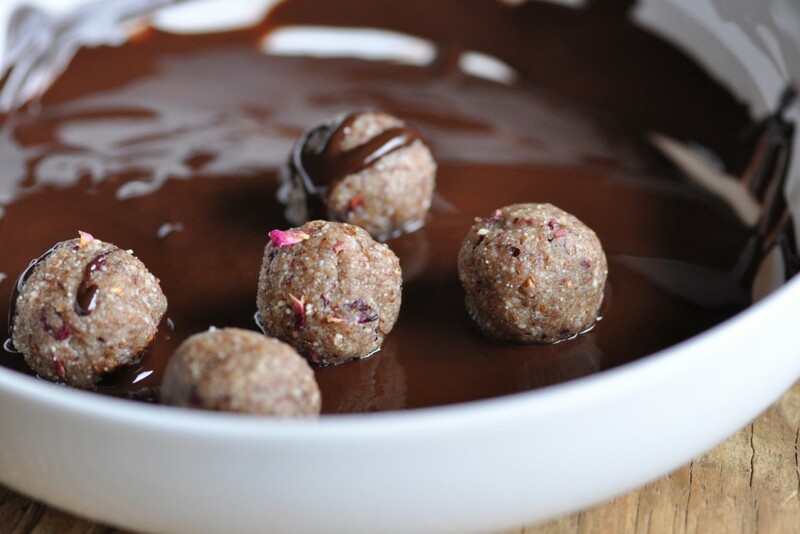 Place the coconut and the cacao butter in a bowl over a sauce pan with simmering water. Gently melt the coconut and cacao butter while stirring until you have smooth paste. Remove from heat. Add the maple syrup and vanilla powder. Continue to stir until the maple syrup and vanilla is fully integrated with the chocolate mix. Pour the mix out on a small tray lined with parchment paper. Let it cool a little before you add the toppings but don’t allow it to fully set. You want your toppings to sink into the chocolate. Finally allow the chocolate to completely set in the fridge before cutting it into squares. 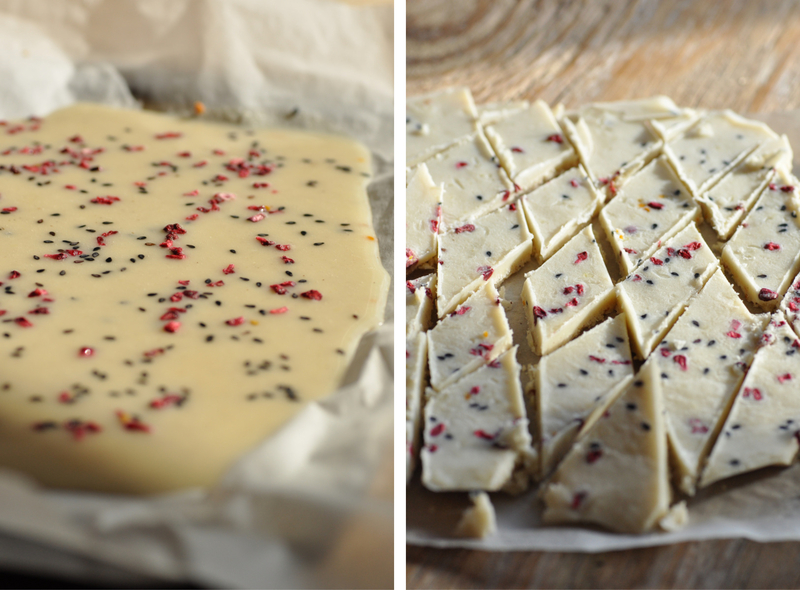 A big thank you to Iswari for allowing me to play with some lovely ingredients! I also tried out this lovely breakfast option and if you are looking for something to take with you on your summer travels / festivals / sporting adventures this is a nice one for sure. *This is a sponsored post. No money was received and all opinions are completely my own. Valentine’s is upon us again. I never got a chance to write a Valentine’s post last year due to some incredibly stormy weather and subsequent power cuts, which lasted for days, so I’m going to have a stab at it this year instead. I have to admit, I have mixed feelings about this whole conundrum… On the one hand I think it’s a nice idea with a day prompting you to do something extra nice for that one special person in your life. On the other hand I feel it has become such a big commercial hype, it has lost any appeal or value. And shouldn’t we take time daily to show our love and appreciation for those in our lives that matters anyway? On any given day? Oh and the whole thing (i.e commercial hype around this ONE day) can easily make anyone who happens to be single feel totally inadequate, sad and even like there’s something wrong with them because they happen to NOT be in a relati0nship at this time. To ME that sends out an entirely wrong message. A good few years ago (five to be precise), I was dating an absolutely gorgeous guy, beautiful to the core. He wasn’t a great guy for presents or cards or anything at Valentine’s, yet during the short time we had together he gave me one of the greatest gifts of all. He gave me the amazing gift of allowing me to be completely and utterly myself. Even though, I would considered of myself to show up as me and to go my own way (most of the time at least), he allowed me to do that in our relationship too. I was able to be true and authentic to who I am because I felt safe, loved and trusted that it was going to be Ok to be vulnerable and show sides of myself which I might have been reluctant to show for fear of being rejected or judged. (Like we all tend to do, especially when we don’t know someone all that well) It was a blessed gift to get and I’m grateful to now hold that experience in my heart. 1. Love ourselves with compassion and unconditional whole-heartedness. And if we don’t already do so we need to keep working at it. For if we can’t love ourselves for all that we are (and are not) then how can we let someone else in? Creating a space for self-love and a feeling of self-worth hold the key to opening so many doors. 2. Allow or hold a space for others to be authentic to who THEY are. Allow them to feel loved and safe enough to be vulnerable without being judged. Perhaps this is what’s called unconditional love…? Maybe Brené Brown puts it better in her TED Talk. I don’t know, but I do think she’s on to something, after a decade of research into it. It’s all to easy to try to change others, whether they are partners, friends, work mates or family members. If we DO care about them, then giving them the gift of allowing them to BE who they truly are (as opposed to who we would like them to be) is probably the most amazing gift we can ever give. And you know, this is actually easy enough to do. Being present and truly listen to someone is so rare these days, so by giving your full attention to a conversation with someone dear, you can simply make that person shine in their own right. Somehow we are often aware of those people who are naturally good listeners because they tend to make us feel good when we are around them. Thing is, we may not be aware that it’s their listening skill which is what sets them apart. Beauty is though, we can all learn or improve this skill. We simply need to practice active listening a little more. Self-love. Something so incredibly important but so incredibly hard. The definition of the word is: care and regards for ones own happiness and well being. Can someone wise out there tell me WHY we don’t see attending to this very need, as important as it actually is? And please don’t get self-love mixed up with arrogance and self importance. Often (in my experience) people who show up with those kinds of traits have the least amount of self-love. Because when you care for and value yourself the need to make others feel inferior is simply not necessary. Being comfortable in our own skin, being happy and content in our own company and making choices based on self compassion seems to come easier to some than others. I came across this little list of 10 things you can start doing to bring more self-love into your life. Worth a look. In the name of LOVE I challenge you do so something to this weekend to show yourself how much you care about you. Then share the love far and wide! But start showing yourself some love first. Start with grinding the almonds into flour. I usually use a blender for this but you can use your food processor too. Half ways through grinding the nuts add the dried flowers. Add your ground almonds + flowers, maple syrup, vanilla extract and rose water to a food processor and blend until you have a sticky dough. Make small balls from the dough and then chill them in the fridge to harden up a little, for an hour or so. Melt the chocolate in a bowl over warm water. Roll each ball in the melted chocolate until well coated. Let them set a little on a lined tray before you sprinkle some rose petals and bee pollen on top to make your treats look extra pretty! Store in an airtight container in the fridge. The marzipan will last, I mean keep… for a few days in the fridge. 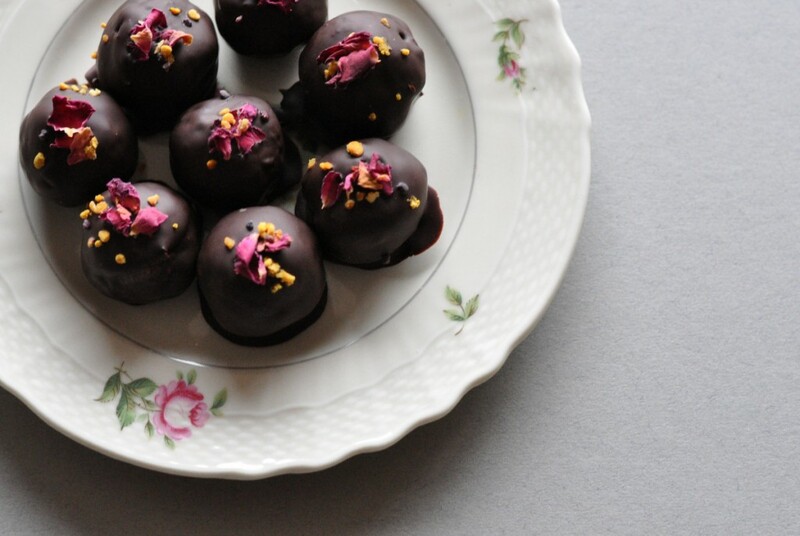 These treats are vegan (without bee pollen) and gluten and dairy free.